Tim Feldmann is the director of Miami Life Center, the Yoga shala (Yoga studio) he founded with his wife Kino MacGregor and Matt Tashjian. He was set on the Yoga path by his first teacher, Lino Miele, and is authorized to teach directly by the founder of the Ashtanga Yoga Method, Sri K. Pattabhi Jois, and his grandson, R. Sharath Jois. 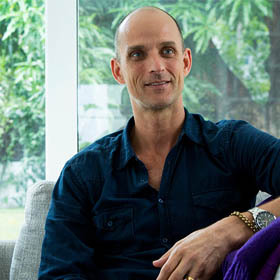 A practitioner of the Advanced A series, Tim is dedicated to Ashtanga Yoga’s traditional method. A near fatal falling accident in 1992 led Tim on the yogic path. His teaching integrates extensive studies of F.M. Alexander Technique and sitting meditation with 20 years of experience as a professional dancer and an internationally acclaimed choreographer. His in-depth knowledge of functional anatomy, alignment, as well as the idiosyncratic body and mind in stillness and in motion, creates the platform upon which his solid understanding of the Ashtanga method rests. Tim’s humorous, straightforward yet profound teaching style makes him a cherished teacher, traveling extensively throughout Asia, Australia, Europe, and the Americas.